Batwoman in a new comic? I have to check it out! After I be contrarian cause that is my nature! Admittedly I have reservations about making lesbian Kate Kane whose style tends to play around with gender presentation into a very femme pinup which is generally marketed to straight men. Yeah a lot of women have taken a liking to the Bombshells for a lot of reasons but considering some of the merchandising I have seen, I don’t think they have forgotten the whole “appeal to straight men thing”. So going into this comic I had somewhat lowered expectations. It is World War II and as in our world, with a large number of men off fighting the war, women are stepping into roles often denied them. 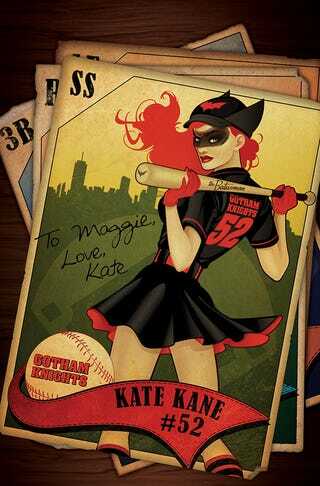 Kate Kane is The Batwoman, a star player on a Sports Vigilante themed womens baseball league where they wear masks to protect their identities from anyone who has issues with the whole idea. She takes this a bit farther with actual vigilantism. The game is interrupted by crooks looking to make some easy money off the crowd but they are quickly taken out by Batwoman with plenty of quips thrown in, who leaves before GCPD shows up. Maggie Sawyer is still on the force and seems highly ranked given she is in plain clothes and ordering a bunch of boys in blue around. Not sure if that was a thing in the 40s but I am not going to complain. Back in Burnside, before it turned into Batgirl’s hipster home, we find out that Maggie and Kate are in a good ol’ fashion Boston Marriage. Or is it a Gotham Marriage in this universe? Unfortunately all isn’t well as Kate, mirroring her feelings that led her to becoming Batwoman in the main continuity, feels like there is something more she should be doing with her life to really make a difference. Apparently before the war she was a world travelling adventurer who fought in the Spanish Civil War! Okay can we get a comic series about that? The relationship between Maggie and Kate is great and really sold the comic to me. Even if they didn’t fight crime I would read about the lives of these gay ladies (they are very happy see) of the 40s. But alas the peaceful life of Mutthattan it isn’t meant to be as a Call to Adventure is sounded at the end of the chapter! I won’t spoil what happens but it definitely put this series on Subscribed for me on Comixology. I am curious where this series will end up going though my guess is we will get several more Bombshells backgrounds before we get into the thick of the plot. Who Shouldn’t Check It Out: People that like lesbians but in creepy straight fetishization way, Baseball fans looking for a baseball comic(there is very little baseballing done), I dunno Nazis?